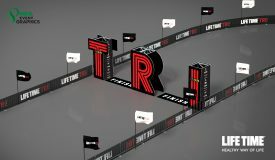 MIAMI, April 4, 2019— Continuing on the positive trend it established in 2018, the Life Time Tri Series promises to be bigger and better than ever when it launches Sunday, April 14 with more than 2,200 participants at the Life Time Tri South Beach Triathlon benefitting Save the Children. The concept, created in conjunction with MPA Event Graphics, is meant to be sport-forward, where the front-facing design purposely showcases the incredible sport of triathlon. Once athletes cross over the new finish line, iconic Miami Beach artwork on the backside will be revealed and showcased in each finisher’s hero shot. The enhancements are a continuance of several initiatives Life Time implemented last year, including first-timer friendly starts, swim clinics and new officiating processes, which led to overall growth in Life Time Tri Series events—and a 20% growth in first-time participants. The finish line will be unveiled Saturday morning, April 13, during a pre-race open water swim. In addition to the new finish, the South Beach Triathlon will feature a new run course. Athletes will span the new boardwalk along South Pointe Park at the southernmost point of Miami Beach, alleviating previous pedestrian congestion along northern sections. South Beach Triathlon finishers will also be the first to receive a new Life Time Tri medal concept, recognizing those who compete in any Life Time Triathlon – indoor or out. Each 2019 Life Time Tri event will provide a traditional finisher medal with a unique twist that will reward multi-race participants. Complete multiple races and assemble your medals into a unique, silver-plated, 9.4” tall water bottle display sculpture: www.southbeachtriathlon.com/2019/02/26/medals. More details and Life Time Tri South Beach event registration can be found at www.southbeachtriathlon.com. The Life Time Tri South Beach Triathlon is owned and produced by Life Time, the premier healthy lifestyle brand. It is among more than 30 premier athletic events owned by the company, including the Miami Marathon, the New York City Triathlon, the Chicago Triathlon, the Leadville Race Series, and most recently, the Dirty Kanza. Life Time champions a healthy and happy life for its members across 143 destinations in 39 major markets in the U.S. and Canada. As the nation’s only Healthy Way of Life brand, Life Time delivers an unmatched athletic resort experience and provides a comprehensive healthy living, healthy aging and healthy entertainment experience that goes well beyond fitness to encompass the entire spectrum of daily life for individuals, couples and families of all ages. For more information visit www.lifetime.life.